processors and controllers in clear and comprehensible terms. How the GDPR differs from the 1995 EU Data Protection Directive (DPD). How the Regulation relates to your organisation and how to adjust your processes to comply with it. The best way of avoiding “effective, proportionate and dissuasive” fines. Additional definitions and a new implementation FAQ. Further guidance on data protection impact assessments (DPIAs), subject access requests (SARs) and the role of the data protection officer (DPO). Clarification of consent and the alternative lawful bases for processing personal data. All organisations – wherever they are in the world – that process the personal data of EU residents must comply with the Regulation. Failure to do so could cost them up to €20 million or 4% of annual global turnover in fines. The GDPR will have a significant impact on data protection regimes around the world. This book shows you exactly what you need to do to comply. IT Governance is a leading global provider of IT governance, risk management and compliance expertise, and we pride ourselves on our ability to deliver a broad range of integrated, high-quality solutions that meet the real-world needs of our international client base. Our privacy team, led by Alan Calder, has substantial experience in privacy, data protection, compliance and information security. 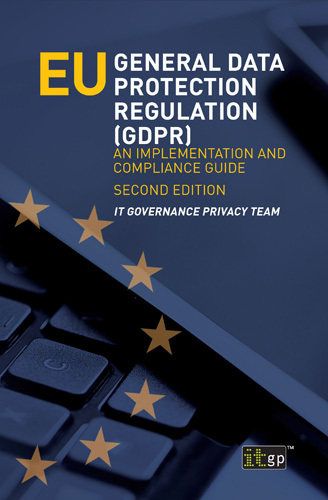 This practical experience, our understanding of the background and drivers for the GDPR, and the input of our fast-growing team of consultants and trainers are combined in this manual to provide the world’s ﬁrst guide to implementing the new data protection regulation.